This year’s Oscar for the Best Foreign Language Film went to Ida, an extraordinary, haunting, Polish historical drama directed by Paweł Pawlikowski and written by Pawlikowski and Rebecca Lenkiewicz. The film follows the story of two fictional women. Ida is a young novitiate nun on the verge of taking her vows when she is directed to meet her only living relative. Wanda, her aunt, a deeply-damaged former Communist state prosecutor, curtly informs Ida that she is Jewish, ‘a Jewish nun’. The two then embark on an uncomfortable road trip into the Polish countryside and their own family’s devastatingly sad war-time past. You can watch the trailer here. Universally admired for its expressive use of stillness and sparse dialogue, its stunning and original cinematography, and understated explorations of anger, grief, guilt, choice and national and personal identity, picked up a host of awards in Britain and Europe, before collecting its Oscar. And yet, the film has also proved to be controversial. Ida is fictional narrative set in the Poland of the 1960s, and commenting both on the suffering inflicted by the Second World War, and the difficulties faced by those coming to terms with their loss, their actions, and the possibility of redemption. It is at once deeply personal and unavoidably political. Some Polish critics fear that while the history behind Ida would be known and understood by most Poles, internationally the film might promote false stereotypes of Polish complicity and collaboration in the Holocaust. This is not an unfounded concern. Reports and documentaries sometimes still talk about ‘Polish concentration camps’ when referring to the Nazi German camps set up inside Nazi-occupied Poland, and Polish contributions to the Allied war effort, from providing the first German enigma coding machine, to vital contributions in campaigns in North Africa, Italy and even in the Battle of Britain, are often underplayed in the press, books and films. At the same time, across the board, whether provoked by Tudor novels or Polish films, commentators are increasingly challenging the seemingly porous boundary between historical fiction and non-fiction, and the debatable responsibilities of authors and directors to convey not just the ‘truth’, but ‘the whole truth’, through their fictions. With painful recent histories such as the events and aftermath of the Second Word War, these tensions are all the more raw. 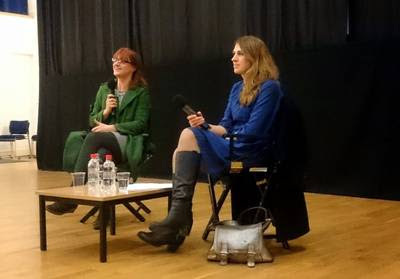 A few months ago I was delighted to interview Ida co-writer Rebecca Lenkiewicz when she visited my local independent cinema, Saffron Screen in Saffron Walden. Previously best known as the author of Her Naked Skin about the suffragettes, the first original play by a female playwright to be performed at the Royal National Theatre, Rebecca is not unknown to either success or controversy. Poland was under Nazi German occupation. The occupiers conducted a programme to exterminate the Jews. Poles hiding Jews risked the death penalty not only for themselves, but for their entire family. Thousands of Poles were executed for helping their Jewish neighbours. The Yad Vashem Institute recognises Poles as the largest group of the "Righteous Among the Nations" for helping Jews. 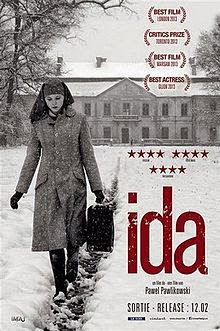 Since Ida won its Oscar I have been asked several times whether I think it is an ‘anti-Polish’ film. I do not. And, as an independent work of art, I do not think that it should have contextual facts imposed on screen before it starts, or after it finishes. A film, like any work of art, is always open to interpretation by its audiences, but it must remain independent if it is to have an authentic voice. Its own voice. Ida may not explicitly state the loss of a fifth of Poland’s population, including three millions Jews, during the war, or the appalling dilemmas forced onto the surviving population. However, the pain and conflicts are built into the atmosphere and locations, and embodied within the characters, and the story encompasses both fear and courage, crime and compassion. This is a film stripped down; a film that implies far more than it says, and shows just how much more, less can sometimes convey. At the heart of Ida, both the film and character, is the question of how to deal with the past when it is uncovered and laid bare. That it has provoked such controversy around this very issue should be seen as a compliment. While I regret that many British people may not know the full historical context behind the film, I feel that Ida adds greatly to that conversation, and does so in the most elegant, thought-provoking whisper.